The 2016 Ultimate Fishing Show features Kevin VanDam and Mark Zona with many other fishing experts in free seminars! Novi — Largemouth and smallmouth bass are the top targets of recreational anglers in Michigan. Two of the most recognized names in the bass-fishing industry – Kalamazoo's Kevin VanDam and Sturgis' Mark Zona – headline the list of nationally-acclaimed anglers scheduled to speak on all species of freshwater fish at the Ultimate Fishing Show–Detroit, January 7 to 10 at Suburban Collection Showplace, 46100 Grand River Avenue in Novi. Kevin VanDam – Friday Only Special Appearance. VanDam is the world's most accomplished bass fisherman with four Bassmaster Classic championships and seven B.A.S.S. Angler of the Year titles on his resume. Last year, he missed qualifying for the Classic for the very first time in his storied 26-year history of tournament bass fishing. True to his word, VanDam qualified for the 2016 Classic coming up in March and will share with patrons at the Ultimate Fishing Show–Detroit the tips and tactics that continue to make him so successful. His standing room-only seminars at past Ultimate Fishing Show–Detroit events have been both entertaining and educational for beginners and seasoned pros alike. Mark Zona – Thursday Only Special Appearance. Zona is one of bass fishing's brightest stars. He made a reputation for himself in the industry with a rod and reel, earning eight top-ten finishes in major tournaments. Zona moved into the broadcast booth and he now hosts his own show on the Outdoor Channel – Zona's Awesome Fishing Show and is a regular on several ESPN Outdoors shows including co-hosting The Bassmaster Elite Series Show. "We've assembled an unbelievable lineup of national and local fishing experts who will instruct and entertain patrons at the Ultimate Fishing Show-Detroit," said Show Manager Ben Nielsen. "Whichever species of fish you target, whether it's salmon and steelhead, bass, walleye, panfish, muskie or trout, there is a seminar tailored just for you." Carpenter has dedicated 15 years of effort to bringing fishing information and bait technology to anglers. He'll educate show patrons with tips for bass fishing on Lake St. Clair. Noffsinger has more than 20 years of experience in tournament bass fishing. A resident of northern Michigan, Noffsinger will explain the techniques and tactics he uses to catch giant northern Michigan smallmouth bass. Walleye seminar leaders are recent Freshwater Fishing Hall of Fame inductee Mark Martin, TV fishing show host Mark Romanack, the "Walleye Woman" Marianne Huskey, Lance Valentine and Chip Cartwright. Martin, who was inducted into the Freshwater Fishing Hall of Fame in 2015, will talk about open-water walleye fishing techniques and how to catch these fickle fish through the ice. Romanack, Fishing 411 television host, author and walleye fishing expert, will outline the finer points of several walleye fishing presentations he routinely uses to catch more and bigger fish. Huskey is known in the professional fishing world as "Walleye Woman." She's a 15-year veteran of walleye fishing and in 2012 became the first female angler to win "Angler of the Year" honors in any professional fishing circuit. Huskey, who was born in Milford, will share the secrets of her success with patrons at the Ultimate Fishing Show-Detroit. Valentine is the founder of "Walleye 101" and the "Fishing Education Center." He has helped countless anglers catch more fish through seminars, workshops and educational charters. He's an expert on fishing electronics and will teach all you need to master your electronics. Cartwright is one of the most experienced anglers on the water. He was born to be a great fisherman, his family owns Wolverine Tackle maker of the world famous Silver Streak. His seminar on how to catch walleyes during the early season is a must see. Jim Bedford is one of Michigan's foremost authorities on fishing Michigan rivers with spinners and other lures. His seminars will teach you how to cover the most water and consistently out produce other methods by targeting aggressive fish. Mike Schultz is the owner of Schultz Outfitters in Ypsilanti. He specializes on fly-fishing in southern Michigan and will share his experiences and tactics on fly-fishing southern Michigan tributaries. Frank Willets owns the Pere Marquette River Lodge in Baldwin, Michigan and will share his expertise on fly-fishing for Michigan trout. Brian "Bro" Brosdahl is one of the most recognized and respected anglers in North America. In fact, several popular ice-fishing products are based on his ideas. Bro's seminars are can't miss to anyone interested in ice fishing. Additional seminars will be provided by Mike Pittiglio (muskie), Kevin Backus (muskie), Jake Romanack (ice fishing), Dave Rose (Alaska), Paul Biediger (fishing kayaks), Dan Armitage (kids fishing), Dave Mull (kayak fishing for bass), Jason Mitchell (ice fishing), Kyle Polesky (fly fishing for pike), David Domka (perch), Bob Kook (perch). Once again this year, Ultimate Clinics on salmon, walleye and bass will be available. This year's Ultimate Fishing Show–Detroit will once again feature an Ice Fishing Extravaganza, a collection of more ice fishing gear than any other show in Michigan. Manufacturer representatives from Clam, Shappell, Otter Outdoors, Frabill, Eskimo, Normark, Marcum, Strikemaster, and many more have committed to attend. Multiple retailers, including Frank's Great Outdoors, will be present at the Ultimate Fishing Show–Detroit with truckloads of ice fishing tackle and gear. "We're getting a late start on ice fishing this year with the warm weather keeping safe ice from forming," Nielsen said. "Ice fishing is a very popular winter activity in Michigan. 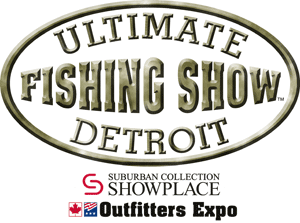 Anglers who can't get out to fish will be able to find everything they need to hit the ice right here at the Ultimate Fishing Show-Detroit. We'll have tons of ice fishing gear, which will be on display and for sale. Frank's Great Outdoors will again hold a shanty truckload sale in conjunction with the Ultimate Fishing Show, and our lineup of ice fishing seminars is second to none." Admission is $10 for adults and $4 for children 6 to 14. There is no charge for children 5 and under. On-site parking is $5. Show hours are 3 to 9:30, Thursday; 11 to 9:30, Friday; 10 to 9, Saturday; 10 to 5, Sunday. For more information, visit www.UltimateFishingShow.com or call (800) 328-6550. You can also follow late-breaking news and developments on Facebook at ULTIMATESPORTSHOWTOUR. GreatLakesBass.com will be in booth 2411.